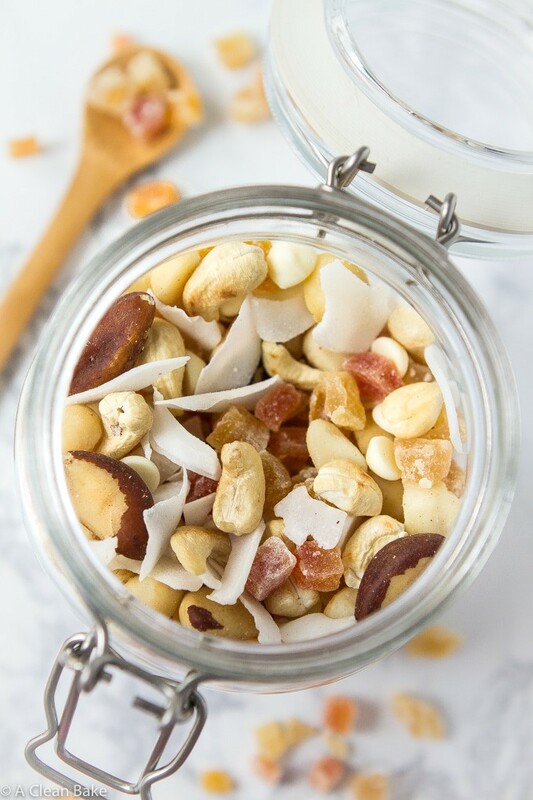 Make yourself a big batch of this subtly tropical flavored trail mix with coconut, white chocolate and tropical fruit for a healthy grab and go snack! If you’re a person who prays to literally any deity (up to and including Zorp. I’ll take all the help I can get. ), please say a few words for us today: we’re off to Florida. On a plane. With an infant. Bryan and I would consider ourselves pretty seasoned travelers, almost to the point of travel fatigued. But this is a whole new ballgame. I’ve heard endless horror stories about traveling with kids and babies and the last time we flew – right before I was no longer allowed to by my doctor – was a 4-hour flight to San Francisco behind a one-year-old who shrieked like someone was cutting off her arm with a rusty bandsaw the. whole. way. I have to admit: the fortitude of her little lungs impressed me. But now I’m terrified. Please let my kid not be that, um, vocal? So with with a 4:1 adult-to-baby ratio, maybe we’ll be ok? The great thing about grandparents is that they never want to miss an opportunity to show off their angelic grandchild. And I’m all for that. The problem (for me) is that they always have the option* to hand back a less-than-angelic baby. *And they should. After raising two kids who did not, to my knowledge, turn out to be serial killers, they’ve certainly done their share of time in the parenting trenches. Overtired? Poop shooting out of his diaper? (Sorry. This is a food blog. I shouldn’t say poop.) Some otherwise unpleasant scenario? That’s not a grandparent’s job. That means Bryan and I have to steel ourselves to be stuck in a tin can shooting through the air for 4 hours with 150 strangers shooting daggers out of their eyes every time any baby makes a peep. (No complaints; I’ve dealt my share of eye daggers.) And since it is generally frowned upon to day drink in public while holding a baby, we have to resort to keeping our blood sugar up and our patience unwavering. 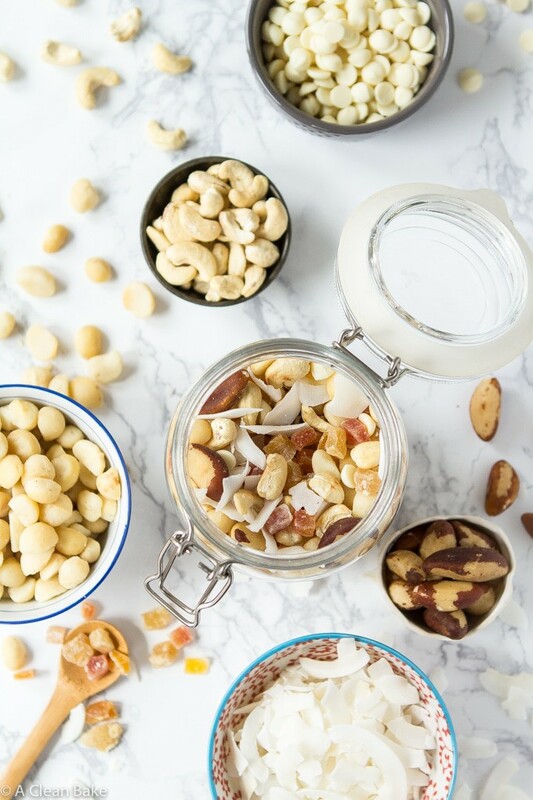 This trail mix can help with at least one of those. For the rest, well, I’m counting on someone handing me a tropical drink with an umbrella nestled jauntily in it the very moment I step off the plane. Will that be you? 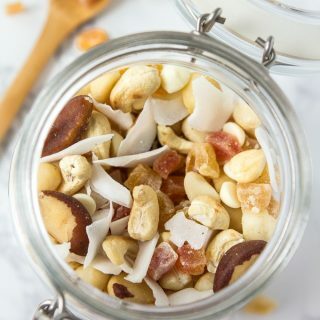 A little secret to simplify this recipe, not that it is a terribly complicated one to begin with… you can get almost all of the ingredients – the Brazil nuts, cashews, macadamia nuts, dried tropical fruit, and even shredded coconut (although I used flaked, rather than shredded for a little bit less messy/more plane-friendly eating, in this version) – from a single source: NOW Foods. You hear me talk about this brand a lot. They’re a local (to me) company that has stellar quality food, nutrition and other wellness products. I have used their supplements and pantry products for years, and I have yet to find better quality at a better price. I don’t know how they do it. The thing about trail mix is that it is awful if you use ingredients that are, shall we say, past their prime. Or just crap to begin with. 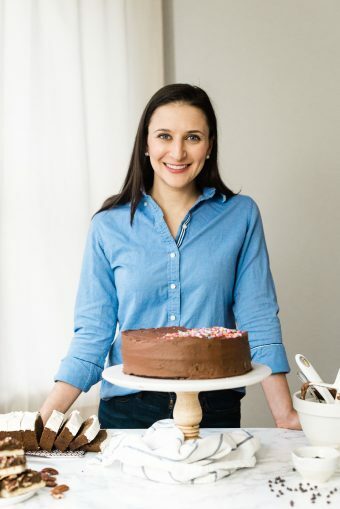 So make sure you use the best, because in a recipe like this, there is nowhere for a crappy ingredient to hide! I’ve provided the links to buy these products below the recipe, if you’re interested. In a large mixing bowl, toss all of the ingredients together several times to combine. Serve immediately, or transfer to airtight containers to store (see note). 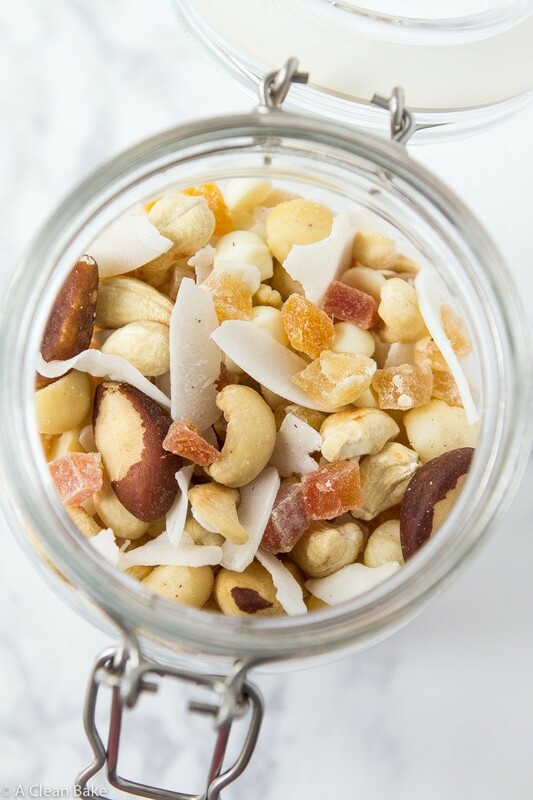 Portion the trail mix into zip top sandwich bags, or a large airtight container for storage. 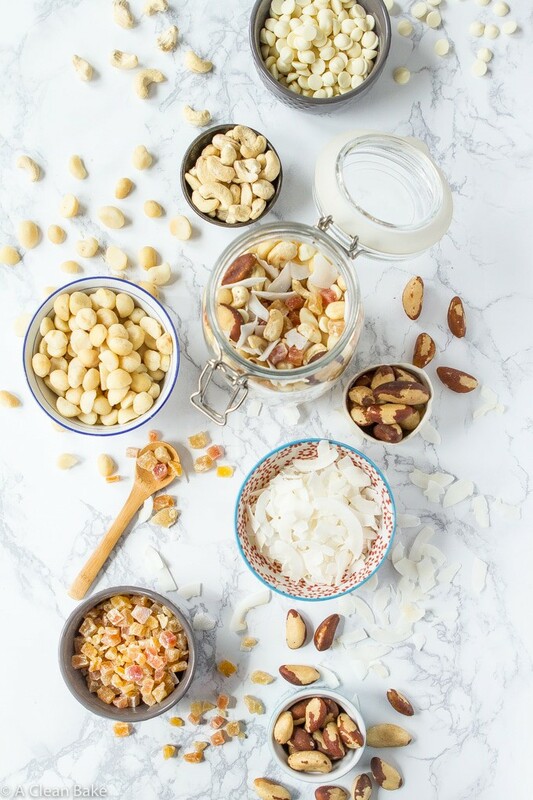 Trail mix is good for up to a month if stored at room temperature. I see that this is labeled vegan/dairy free — what did you use for the white chocolate?